If you are experiencing problems connecting the Flipcause Card Reader with your phone, the following steps should resolve most issues. Note: The Flipcause Card Reader is only supported on Apple/iOS devices. If you are experiencing issues with the card reader on an Android device, you can try these tips too, but they are not guaranteed to fix the issue. We do not recommend using the card reader with Android due to poor compatibility. Connect your device to a strong WiFi connection to ensure best functionality. Try connecting to both WiFi and your mobile data to see if the problem is related to weak or missing connection. Make sure your card reader is fully charged. There is a charge indicator light next to the Micro USB slot. The light will shine green when fully charged, and red while charging. To check the battery status, plug your card reader in to charge and check the color of the indicator light. Remove any case or cover from your device. Some cases/covers can prevent the card reader from plugging in completely, interrupting the connection between the card reader and your device. Make sure you are using an Apple certified adapter. There have been reports of the card reader not working when paired with a non-Apple manufactured Headphone Jack Adapter. You can buy one directly from Apple here. You can also buy the Apple adapter from Amazon, just make sure the seller is listed as "Apple." 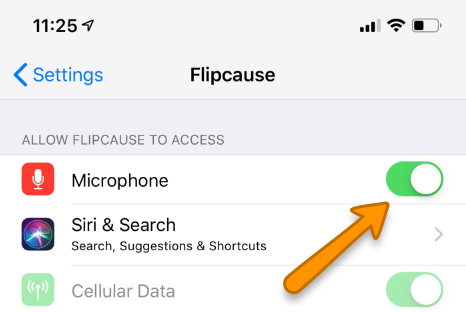 Make sure you've enabled microphone access for the Flipcause LIVE app. Update your device to the latest version of the operating system. Check here for the latest version of iOS and here for directions on how to update. Update your Flipcause LIVE app to the latest version. To check if there is a new update of Flipcause LIVE, open the App Store app, click on the Updates tab, and look for Flipcause in the list of Available updates. Turn off your device and wait 1-2 minutes to restart your device. From the Home screen, tap and hold the app icon until it shakes. Tap x on the app to delete it. Go to the App Store, search for Flipcause, and install the Flipcause LIVE mobile app. Log in once the app is installed. which of the above steps you have already attempted.